I have had the volunteering bug for the past few years. I have volunteered for events in the past fairly regularly, but not as much as I have in the past. In part since my work's been fairly un-fulfilling, I suppose. A few old-time Sakura-con staff people reached out to Hitomi and I and asked if we wanted to volunteer for this event. Why not? The event was held at a luxurious, newly built Westin, across the street from Bellevue Square Mall and connected to the Lincoln Square complex. The hotel was a bit surprising, considering this was a first year convention and most first year conventions are held at seedy airport hotels. And it what was more incredible was that they had invited any Japanese (and Hong Kong) guests at all. 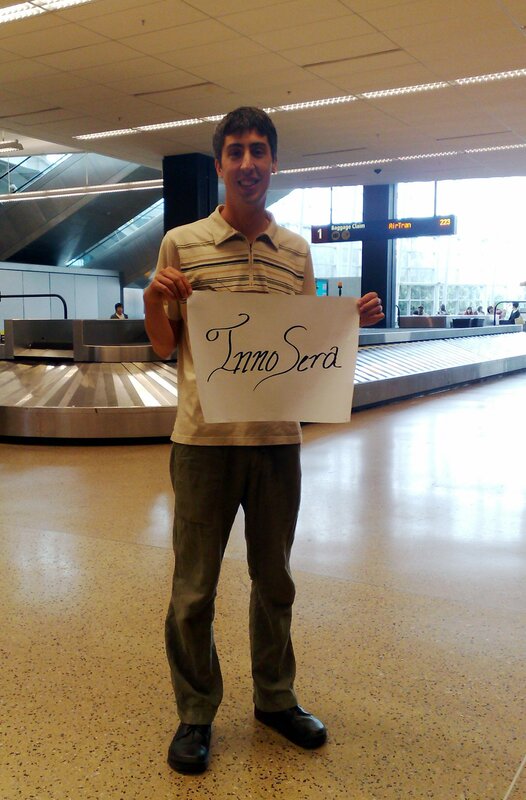 I spent most of the morning on Friday waiting at the airport, holding a sign, and driving a van to and from Bellevue. I made the mistake of waiting at the wrong luggage claim carousel for one guest and Hitomi got on the wrong bus getting back to Bellevue. Our guests was a designer for Baby, the Stars Shine Bright ("Baby"); and her two assistants. Ms. Uehara was coincidentally coming to the U.S. for the opening of the new Baby San Francisco store next week, so the timing of the convention was fortuitous. In addition to having a runway fashion show, Baby also brought a lot of clothes to sell, which meant a lot of work to setup and tear down for everyone. After the requisite guest dinner, I headed downstairs to drink with the male staff of the convention: Obviously a convention focused on fashion and dolls would have few men. Saturday was the fashion show. The show was at around 1PM and would take about 4 or so hours to prepare for. We had hair and makeup artists coming in, there were fittings, a walk-through, and I ended up doing the on stage welcoming and introduction of the designer, Ms Uehara. Here I am on stage. "Baby, the Stars Shine Bright" isn't an easy brand name to say but I managed somehow. I mostly was looking at the fashion show through the lens of one of the assistant's cameras. Post show, we had loli tea time, and then there was a lot of reorganizing and putting things back into boxes. But once this was over, we headed over to Bellevue Square. Ms Uehara and her assistants dressed in (Sweet) Loli outfits the weekend, which was not surprising but attracted a lot of attention from the public. Although the staff by then were used to seeing loli dresses, those in Bellevue Square not as accustomed to seeing the clothing. Everyone was pretty tired and not entirely hungry, so I suggested pizza and we ended up at Pagliacci's Pizza. Somehow we had arrived or were waiting in the wrong spot, and the waitress wasn't happy. Not sure what the heck was wrong, but Hitomi suggested we go someplace else, but I managed to get served. Lady wanted to card everyone but of course the Japanese ladies weren't carrying their passports…Still, we had a good dinner. Sunday went okay. There was a QA session and I was the moderator and computer operator, changing the slides, etc. We had a translator, Lilian/Sayuri, doing the heavy lifting. She had went over the introduction notes Ms Uehara had and had notes so things went smoothly. (There should be an article appearing in the local Japanese newspaper going over Ms Uehara's history.) A private press panel went the same way. Seattle Geekly was there to record for their podcast. And a few hours later, the convention was over. Short, yes? But we then we finally had time to tour Seattle. I was happy to get into Max's van and drive our guests to Seattle. It was good not to be on my feet! The sun was out and though it was cloudy and misty the days before, it was feeling like summer again. Walking around Pike Place Market was interesting in that for every picture our guests took, tourists were taking pictures of Ms. Uehara and her assistants. I got people drinks at the "First Starbucks" and we had them at the park on the north of the market. (Green Tea frappucino tastes not really like green tea at all, to my disappointment.) Post market, we just had about an hour or so before dinner and I took them up to Kerry Park for pictures. Hitomi thought we should go to Seattle Center: No, if you want pictures go here. I probably took a few hundred pictures the whole weekend, using about three or four different digital cameras. A group of Asian guys at the same park took an interest in our group. They obviously were photographers and took a few shots of Ms Uehara or Ms Yamamoto next to the sculpture there. Allen Chu, from LA, runs this site. Maybe her pictures will be appearing soon here: 4rtofclean.com? Dinner at Anthony's was pretty good. I had a chance to talk to Sayuri and Ms Yasui more casually, and actually get to talk about myself, my job, meeting Hitomi, etc. But Ms Uehara was feeling not too well and dinner was cut short a bit. This entry was posted in Uncategorized and tagged baby, bssb, btssb, innocent seraphim, innosera. Bookmark the permalink.